This should be in the nesdev section i think. This is a big topic. You can get by with simple rectangle intersection but it costs cpu. Basically you figure out the tiles your character occupies, the inspect your map data to see if those tiles are blocking. You can use it to check 2 objects collision. You need to take a different approach, if you want to check collisions with BG. Basically, we would not code sprite-to-sprite collision the same way we do sprite-to-tile collision. The first one depends on test rectangles associated with sprite-based objects, where you use the intersection code below to see whether there is a match. Note that for 10 active objects, you may have up to 10*9 / 2 checks to do, which is already significant on a NES CPU. 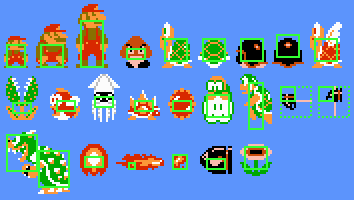 It isn't rare to see collisions with some objects being performed only every 2 or 3 frames, based on speeds and sizes. The sprite-to-map collision (to avoid getting into solid structures) will typically use a ground_properties array that has e.g. one entry per 16x16 block, possibly directly from ROM. When you're about to move a character to a new spot, you will scan through the entries covering the corresponding locations and decide whether you CANDO(walk) at that location or not. The document relating development of M.C. Kids is golden in how to squeeze such tests to fit NES limited bandwidth. - may the source be with you.